WE SUPPORT OUR TROOPS AND COUNTRY. THE ARTIST - Roy Grinnell. Oy, born in Santa Barbara, California, has been drawing airplanes ever since he can remember. When he was not drawing them, he was building plastic models, a hobby he still passionately enjoys. When Roy graduated from Santa Barbara High School he decided to join the Navy where he was stationed in Guam. Thereafter, he attended the Art Center School of Design in Los Angeles where he graduated with honors. He moved to NYC where he was an Illustrator on Madison Avenue for several years. Later on, he decided to become a free lance artist. This decision has led him in several interesting directions! Roy enjoys a diverse and varied background in the arts, and his unique talent has given him an incredible opportunity to express himself in his paintings whether the subject is aviation, western and Native American art, wildlife, illustration, impressionism and realism. When you view Roy's art, you will be amazed at his versatility. As the Official Artist and Honoree of the American Fighter Aces Association, Roy has completed close to 50 original paintings for the AFAA, accurately portraying the aerial combat of aces from WW1, WW2, Vietnam and the Korean War. These paintings are based on the oral history of the aces involved, and as close as they can be to what really occurred as if someone was taking a photograph of the action. Roy has won numerous art awards in both aviation art and western/Native American art. As a western artist, he was invited to join the Cowboy Artists of America. Roy's original paintings are displayed in museums and private collections including The Museum of Flight - Kenneth H. Dahlberg Center for Military Aviation History, Seattle, WA; CAF Airpower Museum - Roy Grinnell Art Gallery, Midland, TX; The George Lucas Collection, The Roy Lichtenstein Foundation; National Museum of the US Air Force - The National Aviation Hall of Fame, Wright-Patterson AFB, OH; National Naval Aviation Museum, NAS Pensacola, FL where Roy was the proud recipient of the R. Smith Award for Excellence in Naval Aviation Art in 1999; The Pearce Museum at Navarro College, Corsicana, TX; Normandie-Niemen Memorial Museum, Les Andelys, France; Polish Military Museum, Warsaw, Poland; Sangre de Cristo Arts and Conference Center, Pueblo, CO; Booth Western Art Museum, Cartersville, GA; Cheyenne Frontier Days Old West Museum, Cheyenne, WY; Albuquerque Museum of Art and History, Albuquerque, NM and others. "High Noon Over Alicante" Roy Grinnell Signed & Numbered Limited Edition Print Co-signed by P-38 Ace J. Part of American Fighter Aces Series. High noon, 14 November 1944. Eleven P-38s of the 80th Fighter Squadron "Headhunters" weaved back and forth above two groups of B-24s droning north at 16,000 feet toward Japanese-held Alicante Airdrome, located on Negros Island in the Philippines. Black smoke and bursts of flame came from the left side of the plane... Both the pilot and plane fell to the ground several miles northeast of Alicante drome. This victory, Major Robbins' 22nd, proved to be his final victory of the war. 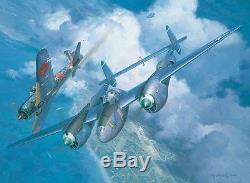 30" by 24" overall size, limited to 1250, Signed by the Artist and hand signed by P-38 Ace J. All Limited Edition prints are signed and numbered (S/N) by the artist and include a Certificate of Authenticity. Limited Edition prints are restricted to a certain number. For example, if 400 prints are made from an original painting, once theyre gone, thats it. There is no limit to the number of open edition prints of a particular painting. Thats why Limited Edition prints are more expensive and more valuable to collectors than "open" edition. Rare objects are more valuable. The term "giclee" denotes an elevation in printmaking technology. Images are generated from high resolution digital scans and printed with archival quality inks onto various substrates including canvas, fine art, and photo-base paper. The giclee printing process provides better color accuracy than other means of reproduction. The quality of the giclee print rivals traditional silver-halide and gelatin printing processes and is commonly found in museums, art galleries, and photographic galleries. All Limited Edition artwork is subject to availability at time of order. The item "High Noon Over Alicante Roy Grinnell Print co-signed by P-38 Ace J.
Robbins" is in sale since Friday, July 12, 2013. This item is in the category "Art\Art Prints". The seller is "airplanesandmore" and is located in Saint Johns, Florida. This item can be shipped to United States, Canada, United Kingdom, Denmark, Romania, Slovakia, Bulgaria, Czech republic, Finland, Hungary, Latvia, Lithuania, Malta, Estonia, Australia, Greece, Portugal, Cyprus, Slovenia, Japan, Sweden, South Korea, Indonesia, Taiwan, South africa, Thailand, Belgium, France, Hong Kong, Ireland, Netherlands, Poland, Spain, Italy, Germany, Austria, Israel, Mexico, New Zealand, Philippines, Singapore, Norway, Saudi arabia, Ukraine, United arab emirates, Qatar, Kuwait, Bahrain, Croatia, Malaysia, Chile, Colombia, Costa rica, Dominican republic, Panama, Trinidad and tobago, Guatemala, El salvador, Honduras, Jamaica, Antigua and barbuda, Aruba, Belize, Dominica, Grenada, Saint kitts and nevis, Saint lucia, Montserrat, Turks and caicos islands, Barbados, Bangladesh, Bermuda, Brunei darussalam, Bolivia, Ecuador, Egypt, French guiana, Guernsey, Gibraltar, Guadeloupe, Iceland, Jersey, Jordan, Cambodia, Cayman islands, Liechtenstein, Sri lanka, Luxembourg, Monaco, Macao, Martinique, Maldives, Nicaragua, Oman, Peru, Pakistan, Paraguay, Reunion, Bahamas, Viet nam.